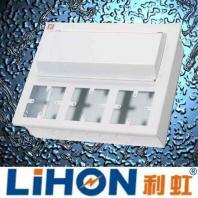 Explosive proof series distribution box,electrical box,metal box,power distribution. Model:MXB-S combined box(switch box&distribution box) Characters: 1)material:0.8-1.0mm thick metal 2)explosive proof distribution box,substantial shell. 3)mounting type:flush mounting,or surface mounting 4)With enough space for cuircuit breaker installing,with 3 empty box for installing swtich box,multi&combined function by one box. Our company is specialized exporter, manufacturer and supplier of sell Explosive proof distribution box in china.